On our walk today, Buster and I were passed by a guy riding a bike on the sidewalk. I have very firm ideas about where adults should be riding their bikes, and it is definitely not the sidewalk. I’m not sure how Buster feels about the issue, but since he likes to walk on the sidewalk I doubt he wants it cluttered up with bikes. This guy didn’t seem very comfortable on the bike and was weaving back and forth on the sidewalk. I suspect that he was driving a car that way, which is why he is now riding a bike. It looked like he was heading to work in a warehouse somewhere by the clothing he had on. He could have been off to his yoga class, but I don’t think so. I noticed him because he had his right pant leg tucked into his grey work sock. I can remember doing that when I was a kid. I probably started doing it after I had come home once too often with black grease smeared on my pant leg. Mom didn’t like it when we made her job of doing the wash more difficult than it needed to be. 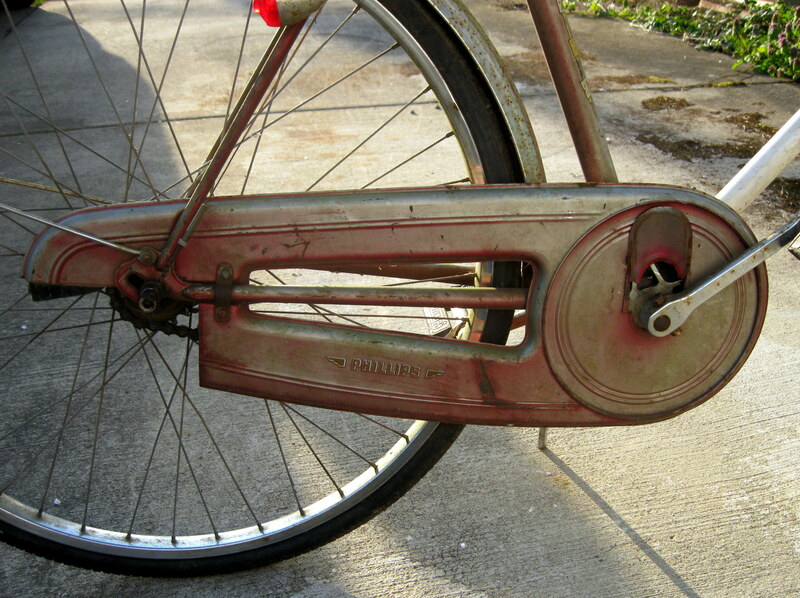 As I recall, the first two wheeled bike that I had came with a chain guard. I always thought that the chain guard was designed to protect the chain, but now I am thinking it was there to protect a pant leg. The chain guard would inevitably get dented so badly that dad had no other choice than to “fix it” by taking it off the bike and tossing it in the trash. Now I am back to that dirty chain again. I probably biked without doing anything at first, until the flapping pant leg flapped itself into the chain wheel, getting my pants greasy and making me fall off the bike giving me some well deserved road rash. I decided then and there that I would have to do something about my flapping pants. Pain is a great motivator. This would have been when I tucked my pant leg into the sock era. This worked well for me and forty years or so later it seems to be working for the DUI guy that passed me on the sidewalk. The only issue with this is that I tend to be forgetful and would often ride until I felt my pants getting caught in the chain wheel. There has to be a better solution! Seek and ye shall find. Someone invented bike clips! With these, I just had to fold your pants tight against my leg and then snap on the clip. It held the pants safely and securely away from the chain until I reached my destination. The only issue with this is that I tend to be forgetful and would often ride until I felt my pants getting caught in the chain wheel. It is getting pretty close. 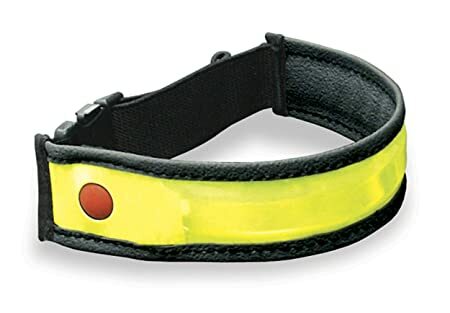 MEC started selling straps that would light up and flash as well as hold your pants tight against my leg. This offered protection from dirty grease and inattentive drivers when riding in the dark. I still use these whenever I am riding when high visibility is desirable. Mostly now I ride when the weather is pretty nice so I can get away with wearing shorts. Shorts work for me very well, although often I will return from a ride with black grease stains on my calf. I often won’t notice the grease until I have rubbed it on something else that shouldn’t have grease rubbed on it. I suppose that I could clean my bike chain every few days which would keep the dirt off of it and prolong the life of the chain. The only issue with this is that I tend to be forgetful and before you know it I’d have a dirty, greasy leg once again. I have read of a method that avoids having the dirt cling to the chain but I haven’t tried it. 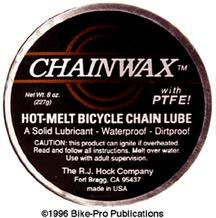 You start with a new chain and then dip the chain into melted paraffin wax. The wax gets in all of the nooks and crannies of the chain and once cooled it flakes off. What is left on acts as a lubricant for the chain and does not attract road dirt and grime. It has to be repeated quite often and is labour intensive. 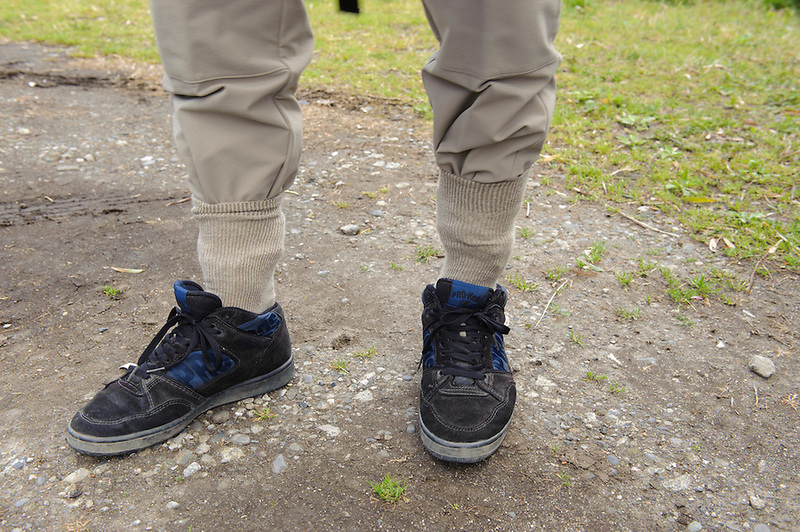 Maybe I’ll just go back to tucking my pant leg into my sock.